First you need to configure and access your RDS MySQL instance. If you haven't configured a remote connection you can follow the instructions on a previous blog post remotely connect to an AWS RDS instance using MySQL Workbench. 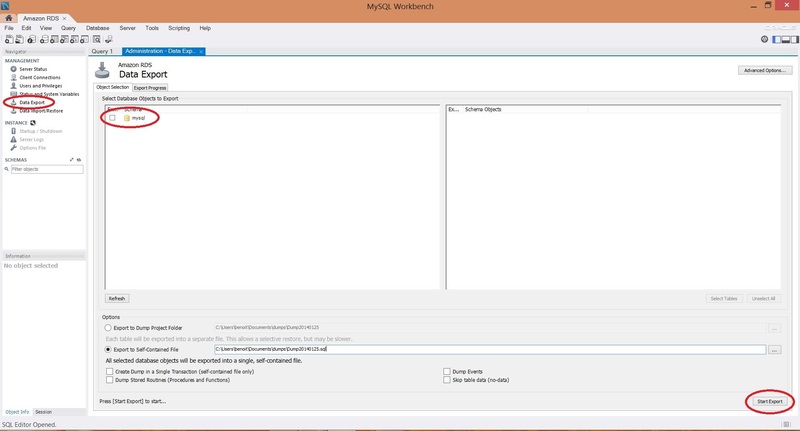 MySQL Workbench is quite powerful because it's bundled with a lot of useful tools. We are going to see how to export a database (but it's the same process to import one). Then select the desired schema to export and choose between dumping data to a folder or to a single file and click on start export.